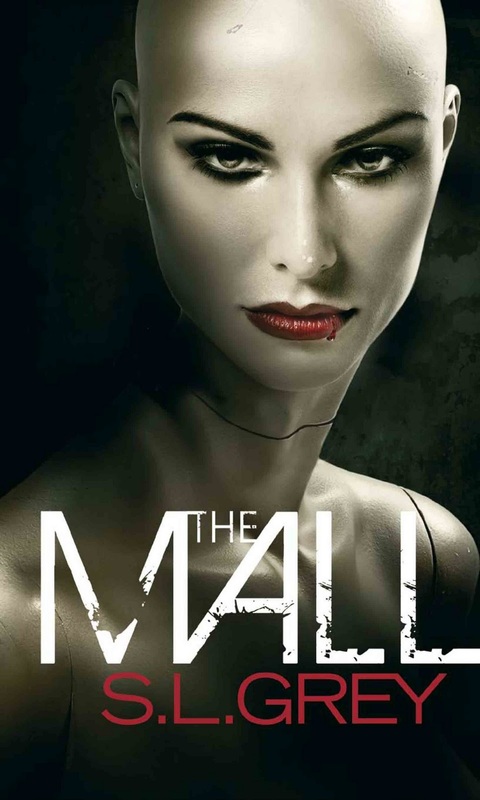 The Mall is the début of, according to the blurb, of a mysterious genderless figure ‘S.L. Grey’, though the internet tells me that it is, in fact, two South African writers, Louis Greenberg and Sarah Lotz. The novel alternates between the viewpoints of Daniel, a young white man working in a bookstore and Rhoda a black girl from the UK. The two of them are thrown together after Rhoda loses sight of a child she had been supervising because she had gone to score some coke. Finding the security in The Mall to be more or less useless, she attempts to seek the boy herself. This brings Rhoda and Daniel together in an unlikely alliance. At first, they appear to be making their way through the service corridors behind the scenes of the pristine and shiny performance of the shopping centre and moving into an area that had never been completed due to a lack of funding. At first, the terror of Daniel and Rhoda can be rationalised as encountering piles of discarded shop dummies and so on. However, as they start to receive a number of inexplicable text messages (the authors do deal with the horror problem of access to communications by giving them full charge but no bars, not elegant, but effective), it starts to become clear to Daniel and Rhoda that their attempt to find the child is going to be a little more difficult than they had previously thought. They find themselves in a parallel universe where the shops are a little more honest about what they sell and how they go about their business. After their experiences in the service corridors, they re-enter what they believe to be the mall that they left a little before it is due to open. However, after they clean themselves out (it was pretty disgusting back there) they start to realise that they haven’t come home. The Mall that they are in is a grisly parody of a real shopping centre. Everything about it satirises the world of commerce and consumerism. For example, the workers in the parallel world are chained to their counters and able to display very little in the way of independent thought. The clothes shop is named ‘Sweat-Shop’ and they grab revolting burgers which pump blood onto their plates for their breakfast. Initially they believe that they are encountering some clever in-jokes (for example, the cut out advertising a Lara Croft who is perhaps not quite so pulchritudinous as the one to which we are accustomed. Though, I should make clear that the Lara Croft ideal of womanhood is not one that I find particularly attractive). But the reality of their situation becomes clear the longer that the spend in the Mall. The shoppers in the Mall are forced to rush around consuming. Any failure to consume will be harshly punished by the Mall authorities. In truth, this aspect of the novel felt just a little on the heavy-handed side. Not completely beyond redemption, the novel is pretty honest and consistent about where it’s going with that aspect. Though I think that the over-the-top nature of these sections was deliberate, that doesn’t, unfortunately, stop them from reading as a little over the top. I am willing to forgive it (just) for this due to the excellence of the earlier horror set pieces and the other aspect of the novel that I enjoyed a great deal. The dialogue. Daniel and Rhoda were thrown together by circumstance and by choice would probably have inhabited completely separate world. The dialogue in the novel reflects this as the contempt that they initially have for one another spills into their conversations. This probably isn’t, in truth, to all tastes. They swear, they sneer, but it’s well done and I enjoyed that aspect of the novel. This is, I think, necessary, though. Neither of the characters are particularly likeable and it seems unlikely that they’d be speaking to each other with courtesy and respect. Consumerism isn’t the only target for this novel. Apartheid also comes under scrutiny. Daniel, as a white kid from a fairly prosperous family and his privilege in this regard, means that he doesn’t have direct experience of racial discrimination, although he does see himself as an outsider in his peer-group. Similarly, Rhoda’s background is South African, though she is in fact from Britain. Neither, then, has a direct experience of what it was like to suffer under apartheid. They find out, accidentally, that people from our world that enter the Mall are referred to as ‘browns’. Initially and entirely understandably Rhoda takes great offence at this for what it implies in terms of the history of South Africa and the mistreatment of black people in the apartheid era. As they learn that this is applies to all from our world equally, Daniel finds that he is no longer privileged. It’s possible to argue that this kind of thing is a bit obvious or heavy handed, but I’m inclined to think that complacency is more dangerous. Something like apartheid is certain to cast a long shadow over a society so forgetting what it meant is dangerous. As it happens, I think that this aspect of the novel is actually more sensitively handled than the anti-consumerist aspect of the novel. So while the satire is possibly a bit much and the dialogue is almost certainly not to all tastes, I think that this has enough to recommend it if you fancy a few scares. It’s not something to which I’d immediately gravitate, but I did enjoy the horrific aspect of it and, while the main characters were pretty unlikeable they were effective, as was the dialogue. So… if all this sounds a bit negative, I’d like to be clear that while I was slightly unhappy with the satire in the shopping mall, I did enjoy the book, in spite of this. It’s just something to be aware of. This entry was posted in Review and tagged novel, s.l. grey. Bookmark the permalink.